Get this juicy nail art look using CND Shellac and additives. 3. Apply two thin layers of CND Shellac Tango Passion. Cure each layer for two minutes. 4. 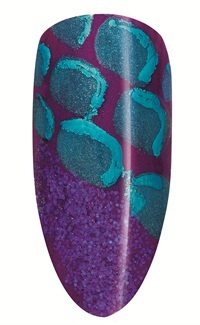 Dip the tip of a dry Gel Flat Oval Brush into Additives Midnight Tide and brush onto the entire nail. 5. Dip the tip of a dry Gel Flat Oval Brush into CND Shellac Cerulean Sea to create small diagonal squares on the top third of the nail. Cure for two minutes. 6. Dip the tip of a Gel Flat Oval Brush, lightly moistened with IPA, into Additives Sizzling Sand Glitter and brush over the entire nail. 7. Using a detail brush, apply Cerulean Sea to the outside edges of the squares. Cure for two minutes. 8. Press the blue transfer foil over the Cerulean Sea.